PERFECT FOR SPORTS MASSAGE AS A SORE MUSCLE MASSAGE OIL! If you play sports, workout or lead an active lifestyle this massage oil is for you! Sore muscle relief is just a massage away with this therapeutic massage oil for athletes. Great Mothers day gift for the active Mom! 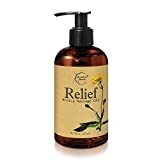 WHETHER YOU SPECIALIZE IN MASSAGE THERAPY OR ARE A NOVICE AT HOME MASSEUSE, Relief Arnica Massage Oil will allow your hands to glide smoothly and will leave the skin feeling soft, smooth & refreshed (not greasy or sticky). MADE WITH PREMIUM QUALITY, ALL NATURAL INGREDIENTS - Sweet Almond Oil, Grapeseed Oil, Jojoba Oil & Arnica Montana Oil are perfectly blended and enriched with Eucalyptus, Lemongrass, Rosemary & other essential oils to create this exquisite body massage oil.